Jewish Film Festivals are popping up all over the world. Just about every major city, and some minor ones, are presenting new films to eager audiences. In reviewing lists of the films that are being shown, we noticed that most explore serious themes, and very few are true comedies. When we find a comedy, we try to bring it to your attention. The lack of comedy in Jewish film doesn't stop the festival promoters from indulging in humor, sometimes irreverent, in calling attention to the festivals themselves. 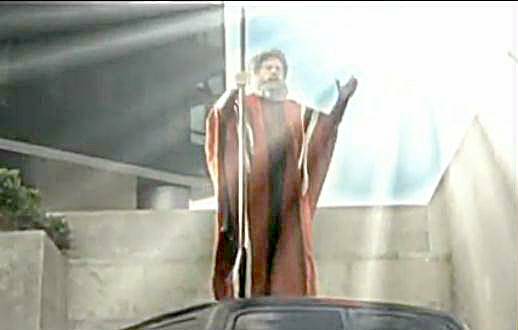 The scene of Charlton Heston as Moses parting the Red Sea in Cecil B. DeMille's The Ten Commandments was just too powerful an image not to inspire comedic copying in commercials for Jewish Film Festivals in Mexico and Canada. In the first clip below, a couple is driving through busy Mexico City traffic, trying to get to a movie theater before the film starts. When traffic comes to a standstill, they despair and ask for a miracle. Moses appears atop a van in full DeMille regalia, raises his arms and extends his staff. The cars split into two rows, allowing the couple's car to pass through. In the second clip, a couple buys a large cola at a movie theater concession stand, and the guy spills it all on the floor. Enter Moses, actually a janitor with a mop, who raises his arms and with a mighty roar splits the cola puddle and lets the girl pass through on dry land. When she passes through, the Moses character lowers his arms. Her date tries to follow her, but fails as the cola spill returns to its original form as the Moses character says "Loser!" Review: First one, genuinely clever and funny....Second one Not at all.